Drug poisoning (overdose) is the number one cause of injury-related death in the United States, with 43,982 deaths occurring in 2013. While much attention has been given to deaths involving opioid analgesics, in recent years there has been a steady increase in the number of drug-poisoning deaths involving heroin. A recent study using data from 28 states reported that the death rate for heroin overdose doubled from 2010 through 2012. 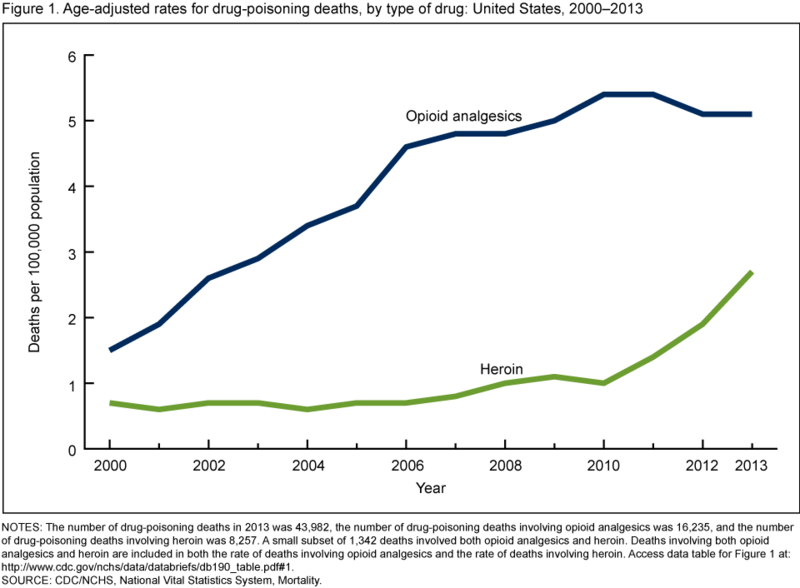 Using data from the National Vital Statistics System, a new NCHS report provides a description of trends and demographics for heroin-related drug-poisoning deaths in the United States from 2000 through 2013. From 2000 through 2013, the age-adjusted rate for drug-poisoning deaths involving heroin nearly quadrupled from 0.7 deaths per 100,000 in 2000 to 2.7 deaths per 100,000 in 2013. Most of the increase occurred after 2010. The number of drug-poisoning deaths involving heroin was nearly four times higher for men (6,525 deaths) than women (1,732 deaths) in 2013. In 2000, non-Hispanic black persons aged 45–64 had the highest rate for drug-poisoning deaths involving heroin (2.0 per 100,000). In 2013, non-Hispanic white persons aged 18–44 had the highest rate (7.0 per 100,000). From 2000 through 2013, the age-adjusted rate for drug-poisoning deaths involving heroin increased for all regions of the country, with the greatest increase seen in the Midwest. This entry was posted on Wednesday, March 4th, 2015 at 12:39 pm and is filed under Drug use (illegal), heroin, National Vital Statistics System. You can follow any responses to this entry through the RSS 2.0 feed. You can leave a response, or trackback from your own site.